do not receive PET Call letter then it is mandatory for these shortlisted candidates to bring at least two coloured photograph and admit cards of written examination along with PET Call letter to the venue of PET so that duplicate PET call letter shall be provided to them. All candidates must reach the venue of PET on time. No candidate will be allowed to attend PET without Call Letter. Late coming candidates will also be not allowed. 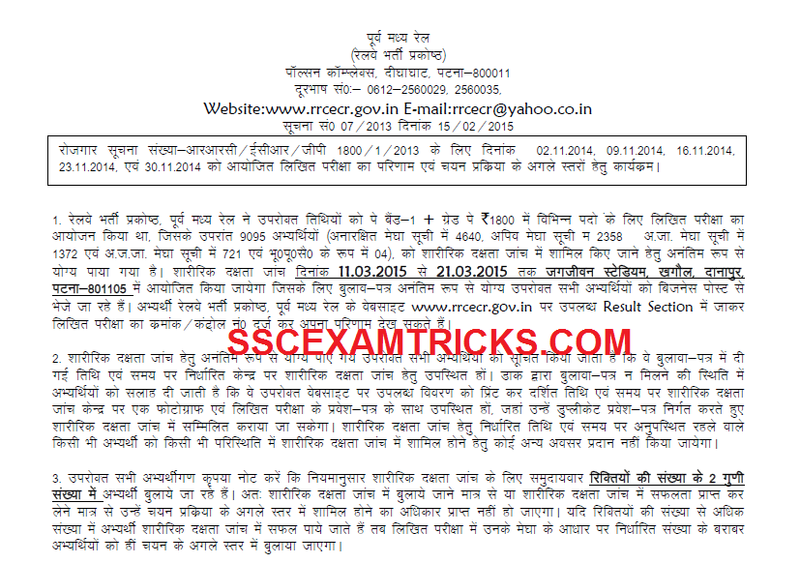 Earlier RRC had invited application against recruitment notification advertisement no. 01/2013 for 4517 vacant posts of Group D for Northern Region Group D. RRC had conducted written examination on 2nd, 9th, 16th, 23rd & 30th November 2014. A huge number of candidates had appeared in the written exam Those candidates who had qualified in RRC Exam 2014 and waiting for PET Schedule can get their PET Schedule from the direct link provided in the end of post.